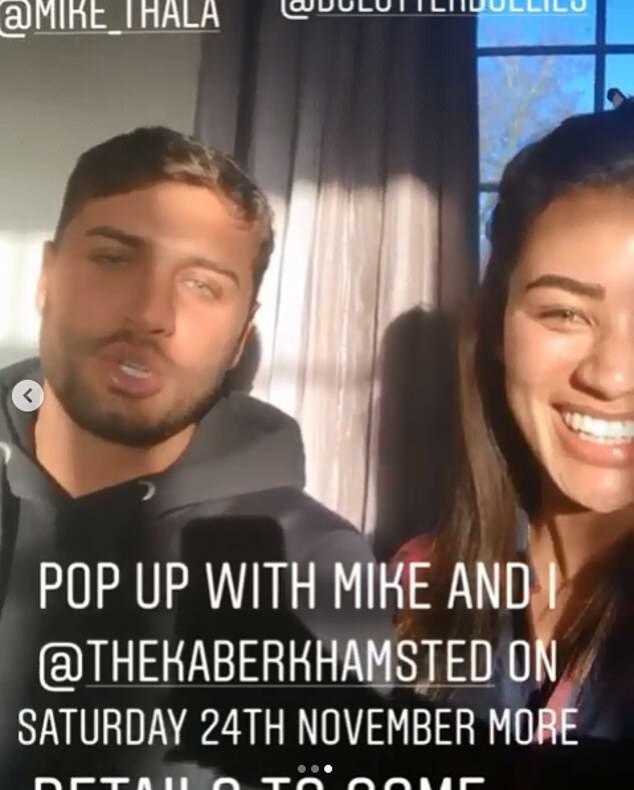 Montana Brown took to Instagram on Sunday to share an emotional tribute to her late friend Mike Thalassitis, who was found dead on Saturday morning. The model appeared alongside him on the ITV show in 2017, and admitted she has been left feeling ‘angry’ at the former footballer, 26, after he was found hanged in in a park in Edmonton, North London on Saturday, and ‘heartbroken’ that she was unable to help him. 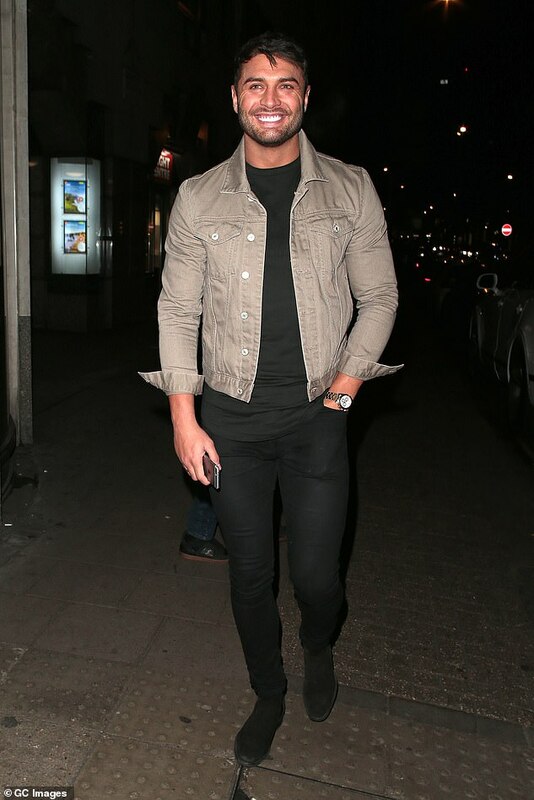 Montana also revealed that Mike had been in a ‘dark place a few months back’ and confessed that her former Love Island co-star had checked on her daily earlier this year, when she was ‘struggling’ herself. Alongside recent photographs of the pair enjoying a night out together in London, she wrote: ‘I’ve thought long and hard about what I want to say, I’ve woken up and unfortunately this wasn’t just a nightmare so this is to you Mr Thala. 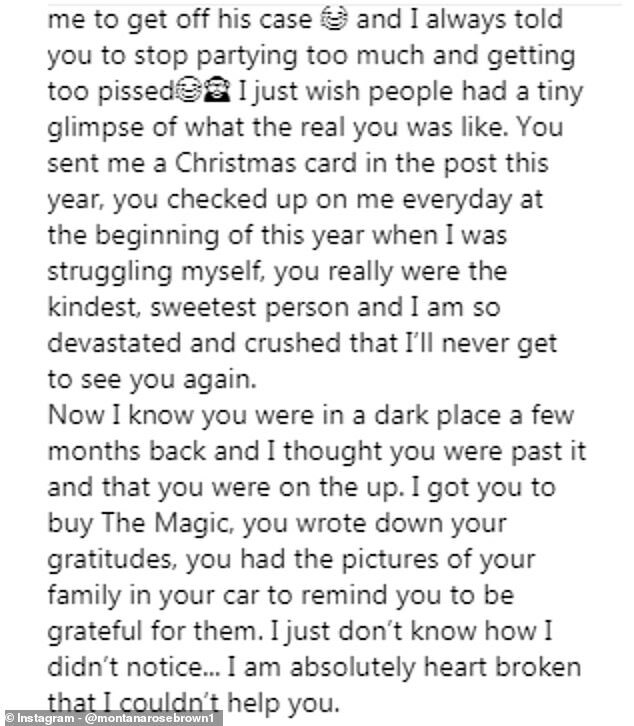 ‘Firstly, I’m so angry at you for doing this because you are so loved by so many people and I just wish you picked up the phone so we could’ve sorted this out. ‘This didn’t need to happen. Secondly, it annoys me that you were so misunderstood. ‘Muggy Mike’ was your stage name and let’s face it, the ladies did fall at your feet BUT everyone had this impression of you and you were literally the opposite you were one of a kind. ‘Mike, you were so thoughtful, caring and loyal to me and all your friends, you know some of my darkest secrets and I know yours. ‘I could always rely on you to tell me when I’m being a nut job to Elliott and tell me to get off his case and I always told you to stop partying too much and getting too p*ssed. ‘I just wish people had a tiny glimpse of what the real you was like,’ wrote Montana, before giving her followers an insight into his kind and caring character, and revealing that recently he had been in a ‘dark place’. She penned: ‘You sent me a Christmas card in the post this year, you checked up on me everyday at the beginning of this year when I was struggling myself, you really were the kindest, sweetest person and I am so devastated and crushed that I’ll never get to see you again. ‘Now I know you were in a dark place a few months back and I thought you were past it and that you were on the up. ‘I got you to buy The Magic, you wrote down your gratitudes, you had the pictures of your family in your car to remind you to be grateful for them. ‘I just don’t know how I didn’t notice… I am absolutely heart broken that I couldn’t help you. Devastated Montana vowed to open the restaurant, The Skillet, which he had been working on prior to his death, with drinking entrepreneur Scott Neilson. She wrote: ‘I will help open your cafe with Scott because you worked so hard on it so don’t you worry! ‘I can’t imagine how much pain you must have been in to do this, and the fact that you went through this on your own breaks my heart. 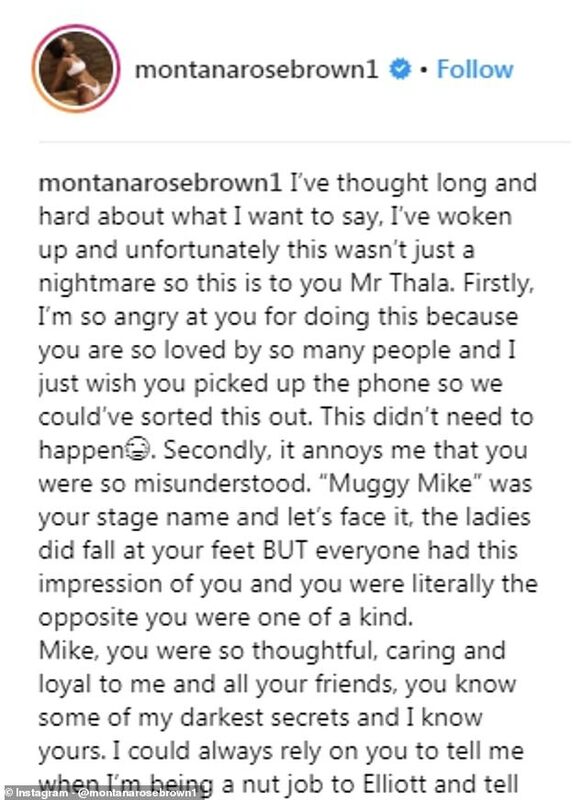 In addition to her long written tribute to her late friend, Montana also spoke to BBC, admitting she is still in ‘shock’ following the news of Mike’ death. 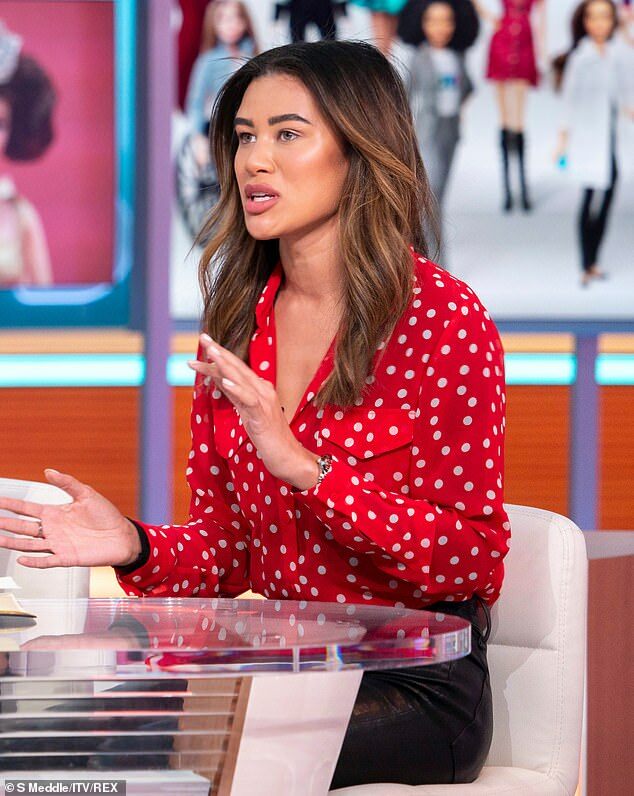 Montana also insisted that the public’s perception of Mike didn’t chime with the real-life reality, describing her former Love Island co-star as ‘thoughtful, caring, and … fiercely loyal’. Speaking to the BBC, Montana explained: ‘Mike was so misunderstood – on television he was known as playing the ladies and everyone had this perception that he was this classic lad that didn’t have feelings. 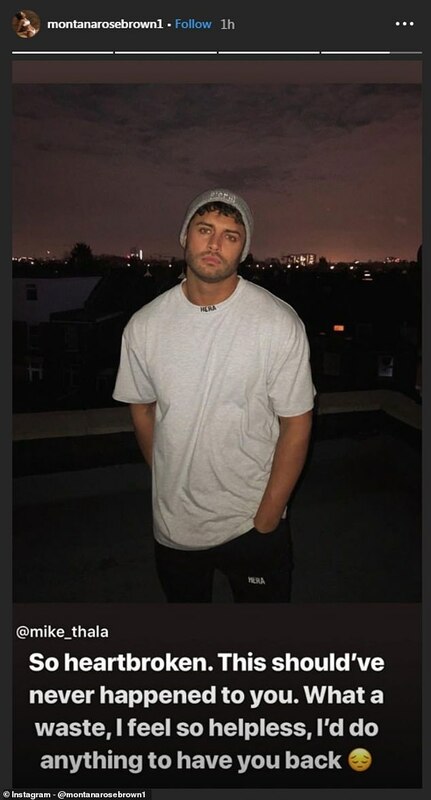 The Metropolitan Police confirmed that Mike Thalassitis was found hanged in a park in Edmonton, North London on Saturday. Mike’s manager confirmed the shock news of his passing on Saturday evening. The news of his death comes just months after his best friend Danny Cutts passed away, with further reports suggesting he had been grieving his late grandmother. TOWIE star Megan McKenna dated the late television star for seven months and confirmed their separation in August 2018. The former League One footballer, who comes from a Cypriot family, enjoyed a successful playing career before becoming a beloved reality TV star after appearing on season three of Love Island in 2017. Previous Post:Comic Relief suffers £8million drop in donations for Red Nose Day… is MP David Lammy to blame?